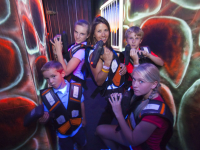 Round up the whole gang for an Old West shootout in this state-of-the-art Laser Tag arena in Glenwood Springs, Colorado. A short drive from Vail and Beaver Creek, this fun indoor vacation activity is great for kids, teens, adults, birthday parties and more. Located at Glenwood Caverns Adventure Park...America's only mountain-top theme park and western Colorado's #1 must-see attraction! Thrill rides, kids attractions, mountain-top restaurant and more. With the Funday Pass, get unlimited turns on most attractions, plus two walking cave tours. Buy online and save. Open year-round.